I ended up using a thinner instead of water like in Fran’s tutorial. I found that my best results were when I used four parts thinner to one part of the colored paint (gave it more of a watercolor type of feel). I also used a dropper instead of a brush, which I would not suggest because it creates air bubbles. You can pop them with our fingers before they dry, but didn’t catch all of them. 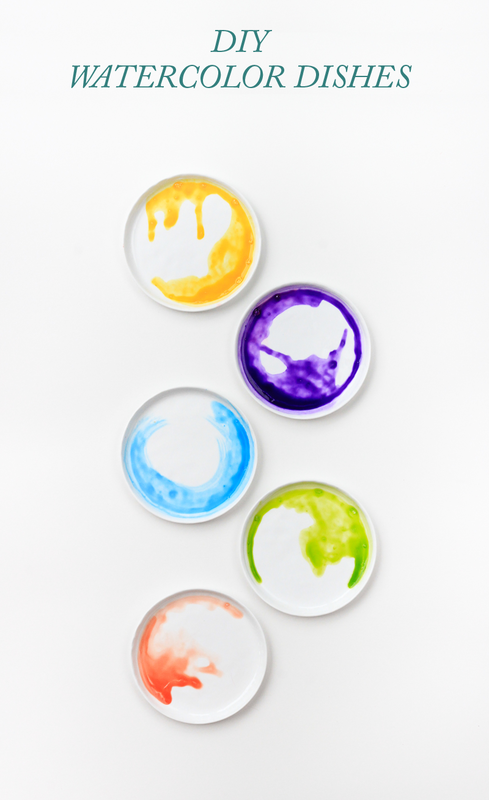 If you are making plates for food, please make sure your paint is food safe. I also recommend picking up a few extra plates to experiment on until you get the results you want. You can get the plates I used here. Overall I thought this project was super easy and a bit addicting to be honest. I can’t wait to try it again using only a brush. I have a feeling I’m going to be whipping up a few more for holiday gifts! Have you ever tried this one before? What did you think? And if not, you can get the full tutorial right here! I adored Frans and now I’m adoring yours! Love how they turned out, pinning. Ohhh these are so pretty! Love how they each are so unique! These are so pretty! Love the pop of colour it will give to a dresser!